Closing this book at midnight on Tuesday, July 17th following the press conference with the presidents of the United States and Russia was a surreal experience. The act of finishing this chilling spy novel, created by one of our premier modern-day novelists, should signal the end of the story. Go to sleep now. It’s just fiction. 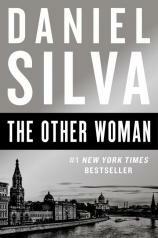 Know this: THE OTHER WOMAN is not a ripped-from-the-headlines thriller about current events. It’s an entirely different scenario, one that includes conjuring the ghost of Kim Philby, the master spy of the 1950s, who successfully infiltrated MI5, Great Britain’s version of America’s CIA. Gabriel Allon, Israel’s head of national security, waits in a Vienna safehouse on a rainy night in 2018 to recover a Russian defector. This agent has discovered the identity of a mole embedded deep within a Western intelligence agency, and is running for his life. "... tightly plotted and positively jammed with fascinating bits of spycraft... If you are an ardent fan of spy craft, Daniel Silva provides a veritable handbook of the vernacular and sleight of hand still employed from [Kim] Philby’s days..."
The details of the exfiltration --- time, place, method, identity of the defector --- are known only to a handful of the highest officials in Israel, Great Britain and the CIA. Yet, moments before the act is to take place, the defector is run down and killed in the street in plain sight. The murder is a set-up made to look like Gabriel committed the crime. Even his closest allies in the spy community are suspicious of him. He must now endeavor to clear his own name and restore his reputation, even as he loses faith in his colleagues and trusted friends. One thing remains clear: Just as Philby penetrated the highest echelons of the secret service agencies of the West nearly 70 years ago, now a mole is currently embedded deep within the top levels of the Western world’s top spy divisions. Is there a connection? In THE OTHER WOMAN, which is tightly plotted and positively jammed with fascinating bits of spycraft, the reader travels from the Cotswolds, Austria, Paris, London, Jerusalem and Amsterdam, to the mountains of Andalusia and the Potomac River in Washington. If you are an ardent fan of spycraft, Daniel Silva provides a veritable handbook of the vernacular and sleight of hand still employed from Philby’s days, hugely updated with the fiendish electronic listening devices in use today. These abilities make one look at their beloved cell phones and GPS tracking with paranoia. But the old school tricks of the trade still work, sometimes more accurately than all the wizardry of the electronics universe. Beware the shadowy figure behind the window, the unlit cigarette of the woman on the third floor balcony, the faint glow of a lamp in the attic, the old folded newspaper on the corner of the table. If the crossword puzzle is completed, what does it mean? Secrets can be conveyed by means that no hacker can ascertain. It’s as complex as those hand signals between the pitcher and the catcher, but misreading the signs can get you killed. That’s what spycraft is all about --- and that’s what makes THE OTHER WOMAN a great read. Just remember, after you close the cover and turn out the lights, it’s only fiction. Go to bed. Caveat: Don’t turn on the TV when you get up. It’s more real than you think.